Coaching - Break through program! How to take back your life to empower your future! So, you’re ready to move forward and make positive changes in your life. Excellent! I want to be brutally honest with you. I suffered from the debilitating habit of procrastination. It ruled my life for a long time. Then, with help, I decided to make a change. This change gave me the confidence and skills to move forward and create the life I desperately desired, and now enjoy! Having dealt with procrastination in my own life, I understand the psychological roadblocks and the emotional suffering it creates. I’ve combined my first-hand experience, my education in the field of home organization and staging, and my business and personal acumen to create the revolutionary twelve-week course that you see in front of you. It will change the way you think. It will help you change your life. Stop Procrastinating, Start Living is a one-of-a kind program designed to help you learn the skills necessary to start the exciting journey to productive change and self-discovery. We all have excuses for why we don’t want to do something that really needs to be done. We put it off until tomorrow or the next day after that…procrastination at its best! However, procrastination is addictive and leads to chronic behavior. It is like the grieving process….it comes in stages. These stages have no particular order; like school yard bullies, they attempt to rule and defeat us, willy-nilly. How about regret, fear, and sadness? Been there, done that, bought the t-shirt. But I overcame and so can you! Procrastination is the deliberate act of avoiding the things we have to do. Those who procrastinate have developed the habit of lying to themselves and/or others. They have convincingly manipulated situations so that they appear either incapable of performing a task, or do not possess the time or energy to complete the work required. 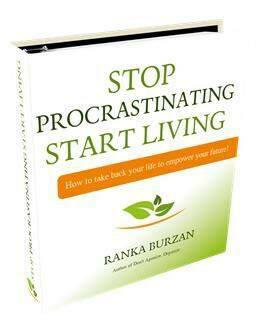 Ninety-five percent of people procrastinate on a daily basis in one area or other of their life. Regardless of when and how they habitually put things off, they all have a mutual enemy, the fear of change, success, failure, rejection or the unknown. Many of us are sleepwalking through our lives and choosing a path that doesn’t require much work or commitment. Because we resist the changes that will result in learning and growing, we settle for less in every aspect of our life. Some of us are addicted to complaining about how unfair life is, instead of doing something to improve it. Many people blame others or use their circumstances as an excuse not to move forward. We need to understand that every change to improve the quality of our lives starts and ends with us. Our family and friends will make their contributions and help us along, and we must be grateful for their gifts of time, money or advice, but change is up to us. Procrastination, blaming others, or complaining about our unfair “lot in life” will sabotage any movement toward what we deserve and desire. Once we realize the toll procrastination has taken on our health, finances, self-esteem and relationships, it’s time to buckle down and work through the obstacles that are holding us back. I am passionately committed to helping individuals get this destructive monkey off their back. It is time to discover the strength that is within each of us to achieve our goals and find our purpose in life. I also believe that a lack of self – esteem and confidence contribute significantly to the habit of putting off the things that we must do, but which we often fail to accomplish. If ever there was a time to believe in the old adage, “honesty is the best policy” it is now. Let’s not waste another precious second feeling guilty for procrastinating. Now that we have recognized this limiting habit, it’s time to make positive changes and move toward the life we have always wanted. •Frees us from stress and gives us the energy to continue moving forward..
•Makes us more effective and productive. •Supports us in following our dreams. •Helps us make and keep commitments. •Assist us in recognizing and taking advantage of opportunities in life.